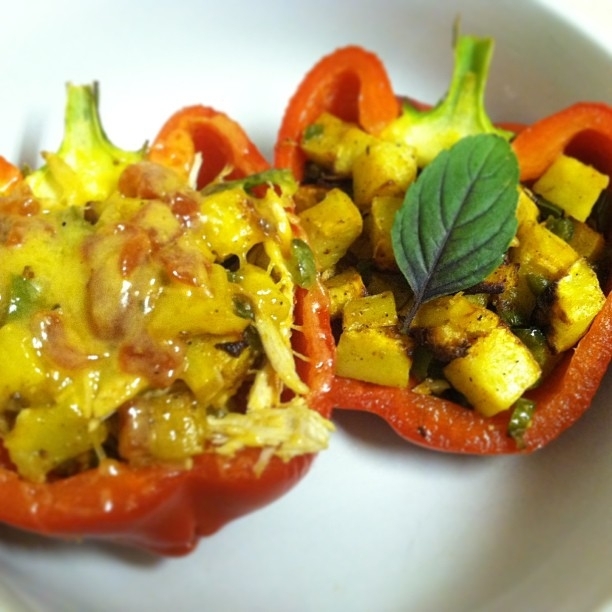 This stuffed pepper recipe goes both ways - vegan and chicken version included! If you are cooking with chicken, start chicken first. Add 1 cup of water to a pot with minced onion, tomato, 2 minced garlic cloves, and a dash of all of the spices. Let chicken simmer for 30-40 minutes â€“ until it falls off the fork when you try and lift it out of the pot. Mix the sweet potatoes, jalapeno and last two minced cloves of garlic with some olive oil and season with the same spices as chicken. Roast in oven for about 10 minutes, making sure to stir every so often to ensure even cooking. To prepare the bell peppers simply cut them in half, and use a spoon to clean the inside, lightly coat in olive oil and throw in oven for a few minutes. You only want to soften them just a little.